While all the spots are taken to join in the spin-in, people are welcome to come and check out the vendor area (10am - 4pm). There will be: Hummingbird Fibres from Nanaimo, Pagean Creations from Campbell River, and Knitopia from Whiterock and of course KBN (Ryan and I) will be there. 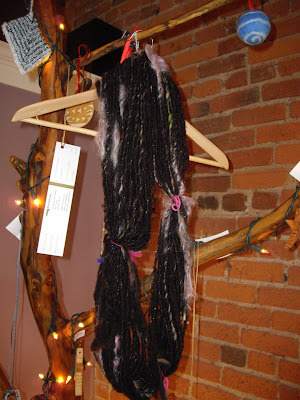 An opportunity to see what other beautiful fibres some businesses from out of town carry. As well Ryan has been dyeing for the last two weeks (I have to remind him to go to bed!) so we will have a lot of beautiful fibres and we will be offering 10% off all fibres. Come check it out if you can, it is a fun afternoon of spinning energy. We'll have an extra chair if you want to come spin with us in the vending area! I almost forgot the link, that would be tease!